As any produce distributor will tell you, handling perishable fruits is tricky business. To begin with, they have a short shelf life and are easily damaged. Then there are the storage considerations. Perishable fruits require refrigerated storage, which is expensive, as well as proper air circulation to maintain freshness. Plus, adding storage capacity to accommodate growing volumes is no easy matter, since it must be done without compromising air flow or, in this high-turn business, product accessibility. That was the challenge facing Ceres Fruit Growers, one of South Africa’s largest distributors of apples and pears. The company found the additional storage it needed in the Poweracks mobile racking solution from U.K.-based Storax Solutions. Poweracks feature a superstructure of racks mounted on powered moving bases. 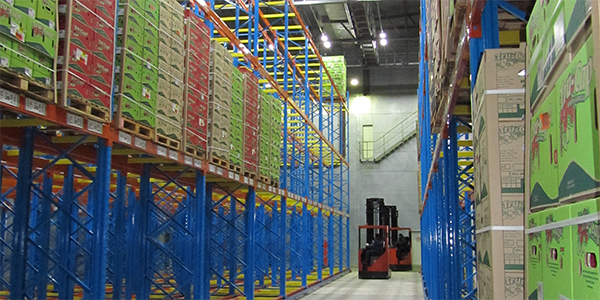 The racks, which are moved by remote control, can be integrated with a warehouse management system. Read the full article in DCVelocity here.